Earlier this week I mentioned attending the Savvy Blogging Summit in Breckenridge, Colorado. The conference could have been anywhere because the schedule was busy (in a good way) and I never got outdoors except for the shuttle rides to dinner! 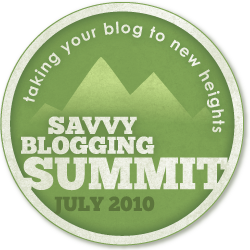 What is Savvy Blogging Summit? The organizers were four ladies (Happy Housewife, 5 Dollar Dinners, The Thrifty Mama, and Mommy Snacks) who started a group to connect with other bloggers, learn and grow together as the Savvy Blogging team. Somehow I found their site and subscribed for the weekly tips on ways to improve this blog. When they announced in March their vision for this conference (small group, hands-on application and one-on-one instruction) I decided to go for it even though I was already registered for BlogHer 10. We didn’t know who the instructors were but the topics included many that knew I should learn more about and a couple I should have but didn’t realize (photography and business law). Although the number of registrants was smaller than the usual conference (60’s) we were broken into three smaller groups for most of the sessions that moved from instructor to instructor. It was a nice break between sessions and I tried to always sit by a different person each time. I used the same strategies at the meals to try to meet as many of the other attendees as possible. Our registration fee included two breakfasts, three dinners and two lunches (which were all delicious!). Many of the conference registrants started communicating months ago on twitter with the #sbsummit hashtag. We learned so much from each other online before meeting on July 8th. We also got more excited about the conference as each instructor and sponsor was announced during the weeks leading up to the conference. Most of the attendees found roommates either on Twitter or The Blog Frog including me. I posted all the annoying things I could think of and someone asked me to room anyway! That wonderful person is Mandy from Since My Divorce. She was a great roommate and a new friend. Half Pint House: Megan’s been blogging for seven years! Part 2 of the summit recap will include key points I took away from sessions including community, design, SEO, monetization, PR and more. In the meantime you might enjoy the recaps of other attendees. Some of them even took pictures unlike yours truly. And I get to see you again at BlogHer next month! Had a great time with you at dinner. And I agree, this was a great experience. I am upset I didn’t have the opportunity to attend. I would love to build relationships with other finance website owners but I am just getting started. Any advice? So glad you found the Savvy site way back when. It was great to have you at the Summit. I love that you sat next to someone different at every session. What a great way to meet people, network, and connect. I loved your mock interview with Val. I can’t wait to read more on your site regarding your journey towards retirement. Very cool! Sounds like you ladies had a ton of fun! Looks like it was an awesome weekend! I’ve learned so much just from reading the twitter transcript!